It seems to have a diversity of thought and some good tips on how to hone in on what you’re doing. It will be a great tool for explaining and teaching those around me who aren’t as “native” to the blog or internet world why blogs can be a great means of communication. Sometimes you need new language to cast vision. I think parts of this book will help me understand the why behind some of the things I’m already doing as well as hone and grow those skills. Next Post A great small group! so is that a recommendation or a helpful book for those who know nothing about blogging. Good question :). I’m actually not sure yet whether I’d recommend it. 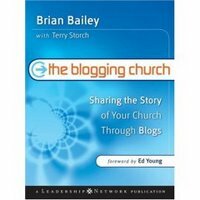 These are just my first thoughts – that it could be good for helping others see the how and why for blogs within the church. I’m sure I’ll get some good stuff out of it too, but I’ll let you know once I’ve actually read it what I think.